Fall is a season of beautiful colors, cooler weather and for many, football. 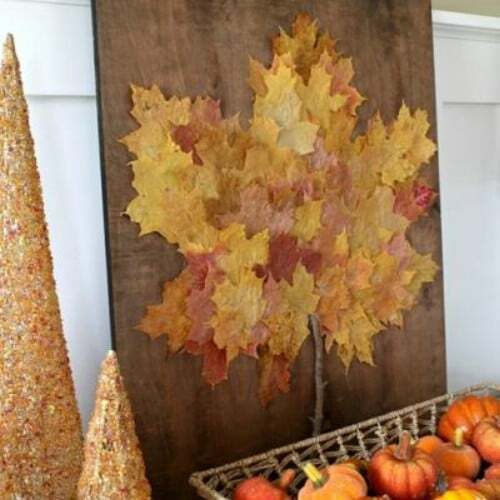 If you prefer the colors to the game, there are a number of wonderful crafts that you can do that will help you to bring those gorgeous autumn colors indoors. 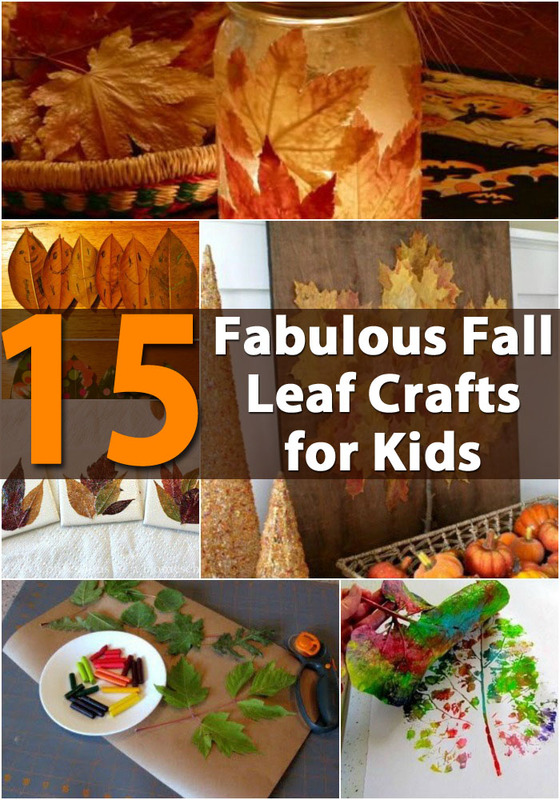 We have collected a few crafts that use fall leaves and are perfect for kids. Leaves can be used as ready-to-use stamps to get nice pictures. Here is a step by step tutorial how to create a Fall Girl picture using a leaf printing technique. With a few white bathroom tiles, some fall leaves and mod podge, you can create beautiful fall coasters that are great for decorating the house or for use as gifts. 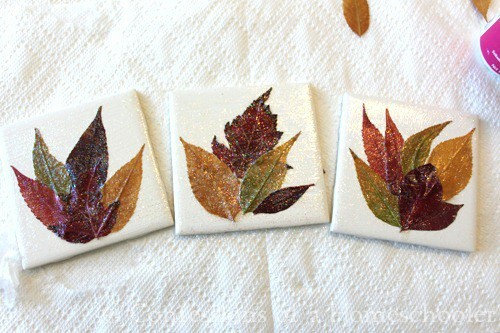 You just have to gather the leaves and then use mod podge to hold them onto the tiles. This is a great and really inexpensive gift idea. The tiles cost less than 20 cents each at most hardware stores and the leaves are free. 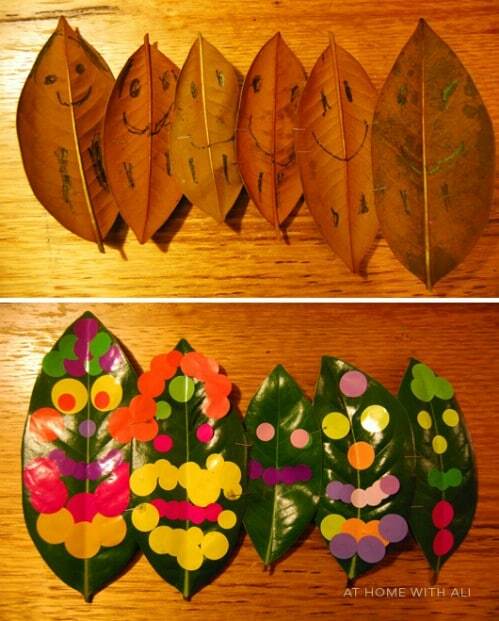 Let your little ones create an entire leaf family. Larger leaves can be used for parents and smaller ones for the kids. You just have to add a few decorations like stickers for the eyes and face or you can use wiggly craft eyes if you prefer. Let them decorate the family however they like and then display them for everyone to see when they visit. You remember rubbing crayon or pencil over things to make their impression, right? Leaf rubbings work the same way. Your little one can gather a selection of leaves and then you just lay them right side up on construction paper or cardstock and rub with a crayon. These are great for framing and giving to grandparents for the holidays or you can just hang them on the refrigerator like your mom did. 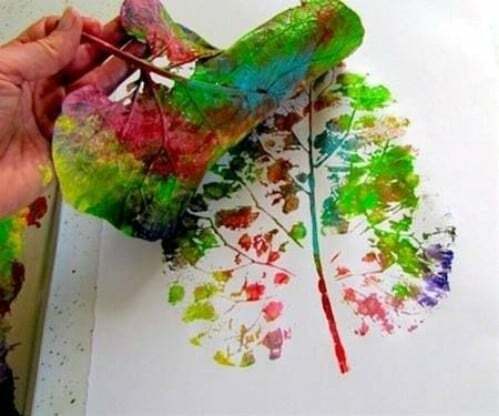 With a few leaves and some finger paints, your child can create a beautiful tree for fall. Just let them paint a large leaf with a multitude of different colors and before the paint dries, press it against clean paper. This creates a beautiful tree because the leaf veins work like branches. This is a great project for toddlers and younger children. 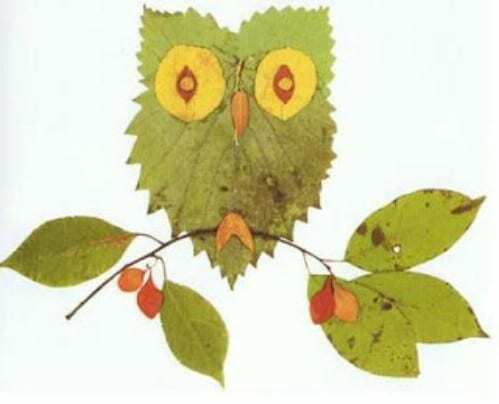 Let children gather leaves of different sizes to make their own leaf animals. Larger leaves can be used for the body and smaller ones make great ears. You can use small twigs for legs or narrow leaves, whichever you and your child prefer. 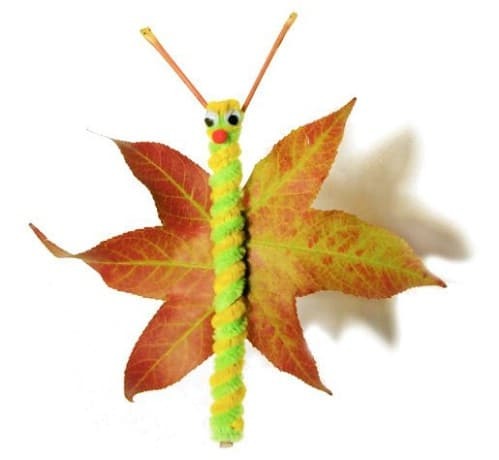 Leaf critters are fun for kids to make and you can add googly eyes and even frame the critters so that your child can keep them for years to come. 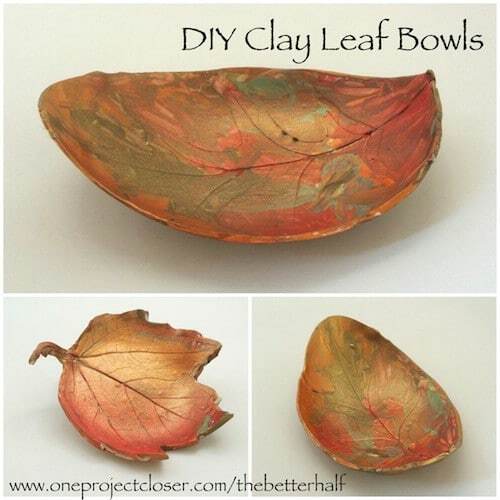 You can make beautiful leaf bowls for your fall décor or to give away as gifts with just a few leaves, some clay and a few other essentials. These bowls are gorgeous for fall decorating and make wonderful Christmas gifts. Your child can paint and decorate the bowls however they like and these are really cheap to make. Thanksgiving is a great holiday for leaf decorating. The colors match perfectly so if your child needs something to keep him busy, let him create some leaf wall art for your Thanksgiving decorating. An old board or picture frame makes a great backing for the art and your child just has to gather leaves and choose a picture to create. You can glue the leaves in place with regular glue. 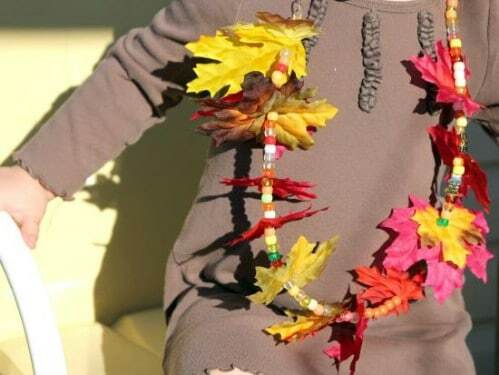 Younger children will adore creating their own necklaces from leaves. You just have to have a strip of ribbon, rope or yarn and you just allow your child to attach the leaves however she wants. These are great for fall slumber parties. Little girls will spend hours creating fashionable necklaces that they can wear home or give away as gifts. Children love butterflies and you can create adorable fall butterflies from just a few leaves, some twigs and a few craft supplies. A hot glue gun will hold all of the pieces together. These are really easy to make so they are perfect for toddlers and younger children. Add wiggly eyes and pom-pom balls for decoration and they will look just like real butterflies when you are finished. Decorate your kitchen appliances with beautiful fall leaf magnets. 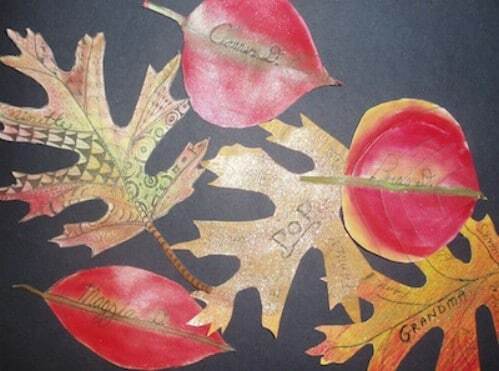 Have children gather a few leaves and then laminate them to keep them from breaking. You can then simply hot glue a small magnet to each one and use them to decorate anything that the magnets will stick to. These are great for teacher’s holiday gifts or to simply decorate your kitchen in the autumn spirit. 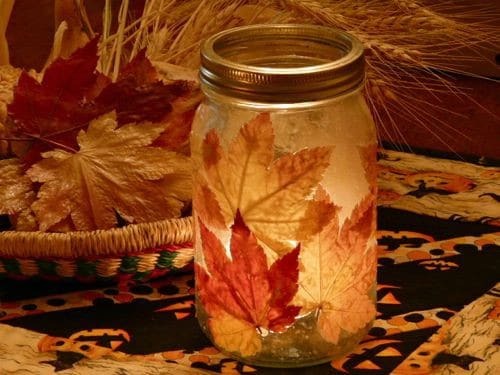 A few old mason jars, some mod podge and fall leaves can be used to create beautiful lanterns. This easy craft can be done by kids of all ages. You just have to use the mod podge to hold your leaves in place. This great craft can be as creative as your children want. They can make a specific pattern or just cover the jars completely in leaves. Small candles or clear Christmas lights will bring the jar lanterns to life. Before you decorate the table for Thanksgiving, let your children create leaf place cards for everyone who will be joining you for dinner. You just need a few leaves, cardstock or other stiff art paper and some paint, glitter and mod podge. Children can get very creative and decorate however they want. Then just have them write everyone’s name on the cards with a Sharpie. 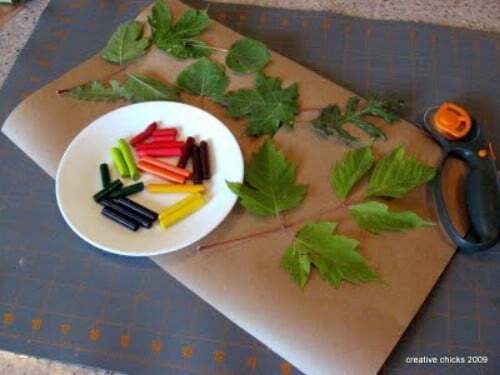 If you have craft sticks or popsicle sticks around the house, kids can use those to make leaf puppets. 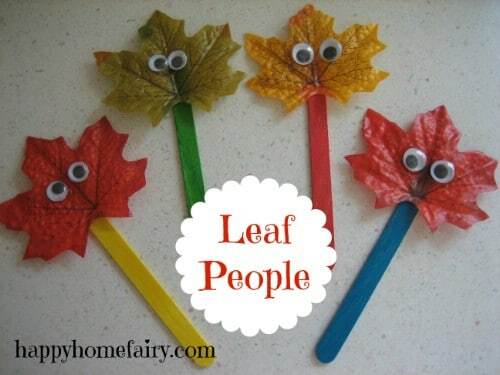 Just glue a large leaf to the top of the stick, add googly eyes and any other decorations that you want and your kids will have hours of fun playing with their little leaf puppets. You can get the supplies at your Dollar Store and make a whole slew of puppets for just a couple of dollars. 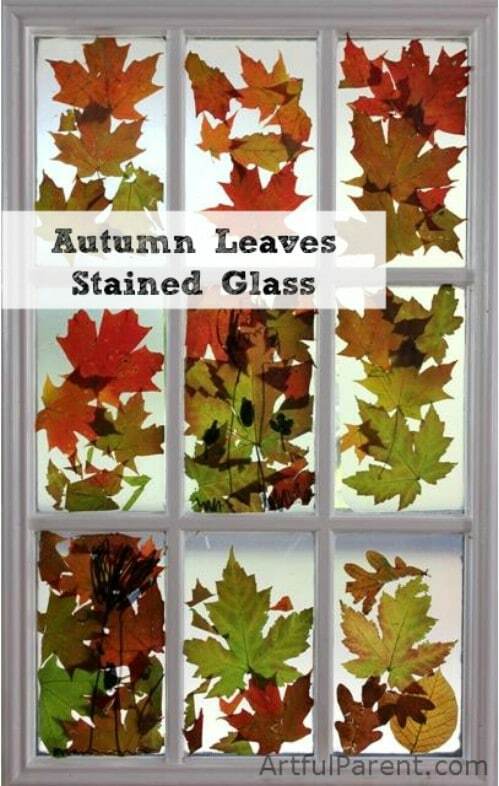 Decorate your house for fall with stained glass windows made from leaves. 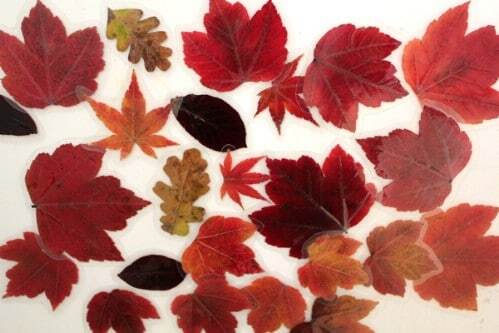 You will need transparent contact paper to get the leaves to stick to the windows. You just add the leaves on the sticky side and then stick it to the window. When it is time to take down your fall decorations, you just peel the paper away and the leaves will come with it. 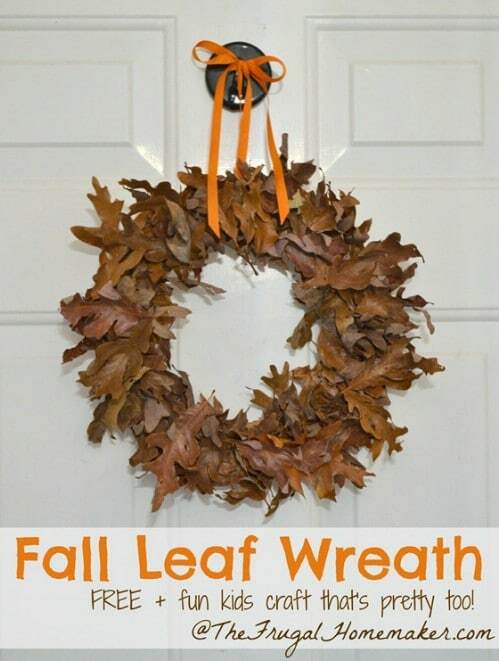 Let kids create an autumn wreath to hang on the front door. You just need to cut them a template from cardboard and then have them to glue leaves in place, covering the entire template. They can decorate with pinecones, acorns or any craft supplies and the wreath can be hung by a ribbon, rope or anything you have on hand. When your kids go on fall break this year, or if you have little ones not yet in school, and they are looking for something to pass the time, these crafts will certainly come in handy. They are easy to make and incorporate everything great about fall. Some of them are perfect for gift giving so if you are looking for gift ideas for teachers or grandparents, let your kids choose a craft and make the gift themselves. They will be very proud of their achievement and their gift recipient will love the thought behind it. Can’t get leaves to stick with regular glue?